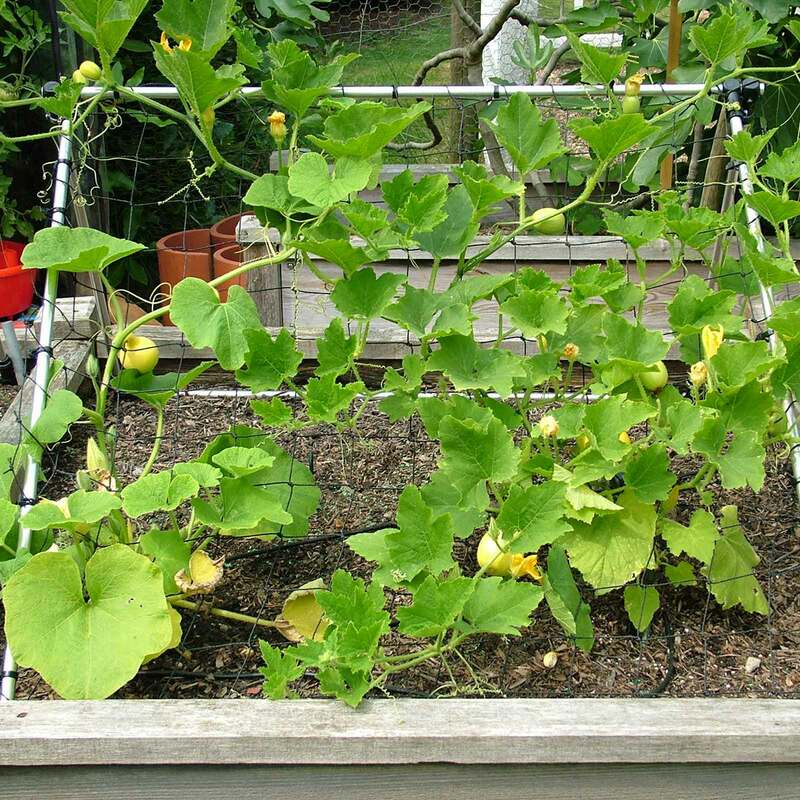 The new dual purpose Harrod Slot & Lock® Squash and Cucumber Climbing Frame will make growing squash, cucumbers and any member of the cucurbit family so much easier. Manufactured from the RHS Chelsea Flower Show New Garden Product of the Year 2012 award winning Slot and Lock connectors and rust-busting 16mm diameter aluminium tubing - a tried and tested combination if ever there was - the cucumber trellis is available in two raised-bed friendly sizes. As well as taking up less space, your plants will be able to climb up the framework supported by netting, whilst angling towards the sun will ensure ripening fruit gets optimum sunlight. 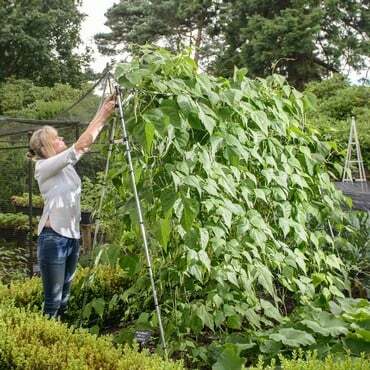 Growing fruit is also kept off the ground too, avoiding soil borne diseases, waterlogging and slug and snail damage - our top tip is to grow smaller squashes on the netting and outdoor cucumbers through the netting for straighter fruit. 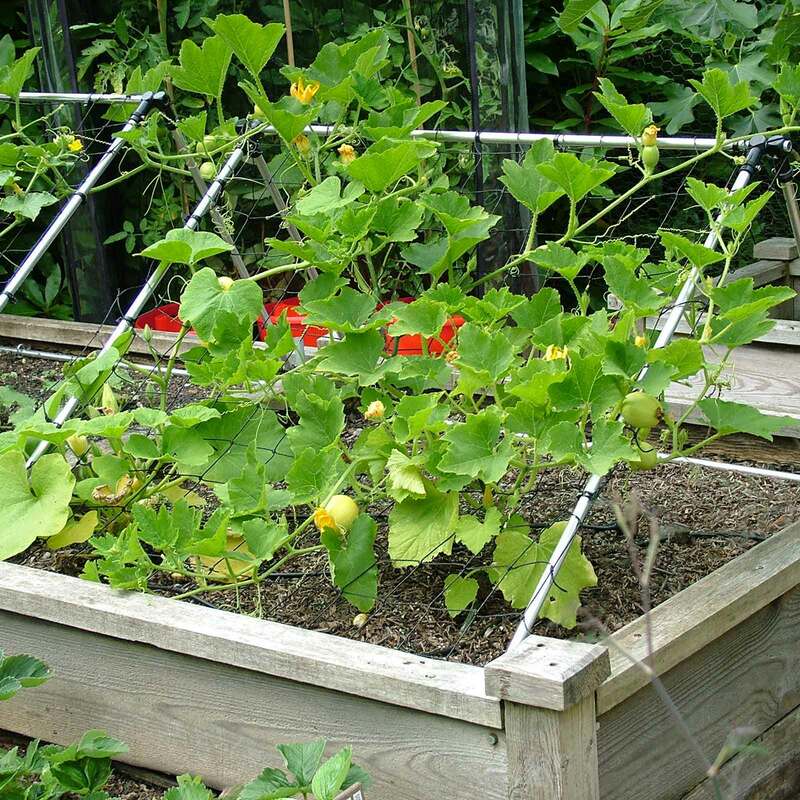 And if you wanted any more reasons why the Harrod Slot & Lock® Squash and Cucumber Climbing Frame deserves a place in your kitchen garden set-up, the room underneath the netting can be used to grow salad catch crops before your plants mature. Simple to initially assemble and then fold up for winter storage and designed to fit inside both our 1.2m square and 1.8m square raised beds, the Harrod Slot & Lock® Squash and Cucumber Climbing Frame is supplied with 80mm knotted net mesh, releaseable cable ties and steel ground pegs. 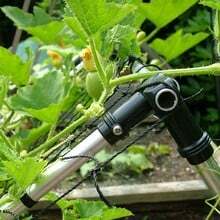 Generally well made, good quality, looks good up once squash can be persuaded to use it. The instructions not so good: definitely important to sort out the bars first, but I think some of them are numbered wrong in the pictures. Also difficult to know when to erect it - my squash plants have a low canopy of leaves before they put out trailers. How to get them ABOVE the net?? Maybe it depends on the type of squash plant. Nevertheless I will use it again in future. It was quite difficult to put together, the screw holes weren't finished on the inside of the plastic connectors and I had to make the holes bigger with a nail. Pretty simple concept but the connector system could be a lot simpler. This is strictly for those expert in flatpack assembly. Even with the help of an experienced DIY neighbour, it was a struggle. It is good quality and smart when put together, eventually. Our horticulturist Martin Fiddes says; "The fruit of those much loved trailing summer favourites cucmbers and squashes have always been susceptible to damage as they lie on the ground ripenening. Damp soil, slugs and snails and secondary rots are all queuing up to take a pop at the fruit before it gets to harvest time. 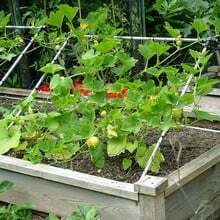 "Exposure to the sun for ripening is also a problem and although gardeners through the decades have carefully turned fruit to face the sun and slipped brick or straw under large fruit to keep them off the soil, the new Squash and Cucumber climbing frame does all that for you. "Ripening fruit hangs safely out of the reach of the associated nasties on the tough knotted net mesh and any frame which includes the award winning RHS Chelsea Flower Show New Garden Product of the Year 2012 is definitely worth its salt. "But it's not just cucurbits which will benefit from the cucumber trellis as the shaded ground underneath is perfect ror raising leafy salds such as lettuce which bolt in the mid-summer sun." KG Verdict - A great addition to the veg garden. This frame is great for growing squash and cucumbers. 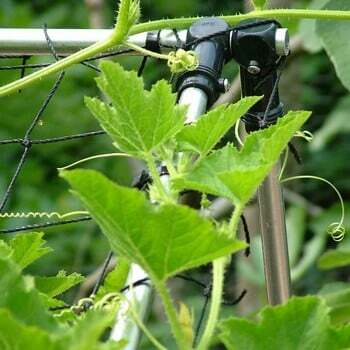 It keeps fruit clear of the soil and the netting supports the weight of fruit too (cucumbers can dangle through the mesh). It can be covered with horticultural fleece to keep young plants warm when first planted out. The same slot and lock system as for the bean frame, but this one is fast and easy to assemble. It's a lovely idea and I'm sure I will discover many more uses for it.